With his relaxed and colloquial narrative voice, author Billy Coffey won me over with the very first page of his latest release The Curse of Crow Hollow. This story set in small-town Virginia paints a very dark picture of what can happen when pride, fear, and superstition intersect. When a group of otherwise well-behaved teens secretly throws a private party and camps overnight at the abandoned mines outside of Crow Hollow--in a forbidden territory believed to be favored by the witch of Campbell Mountain--they trigger a series of events that ripple through every family in their town. A single run-in with the witch leaves one of the teens mute, another jerking and ticking, yet another with half of her face slack and lifeless, and the last with immeasurable invisible torment.Though the town doctor believes all of their ailments are psychosomatic, it doesn't take long before other teens in Crow Hollow are struck with the same afflictions as those who experienced that fateful morning at the mines first-hand. The town's faith is tested because of the witch's curse on its youth, and its levels of fear and insecurity are pushed to the brink. Eventually, events take a turn from bad to worse and long-buried secrets emerge that shake the very foundation of Crow Hollow. This is the first I've read from Billy Coffey, but it will certainly not be my last. The authenticity of his dialog, his vivid and believable characters, and the vignette of a tiny Virginia mountain town that he paints with such eloquence lend the reader the feeling of a road trip that's taken a wrong turn. Having visited a few places very much like Crow Hollow (and certain that I'll visit a few more in the future) ensures that the Southern Gothic flavor of this novel and its hint of the surreal will stick with me for a long time. 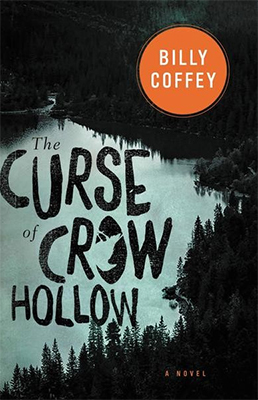 Readers in the Richmond, Virginia, area may be interested to know that Billy Coffey will be discussing The Curse of Crow Hollow at Fountain Bookstore (1312 E. Cary Street in Shockoe Slip) just in time for Halloween. Stop in, chat with the author, and pick up an autographed copy of the book for yourself and a friend!